Any comprehensive review of the salt pool systems available today should begin with a comparison of the older analog models and the newer digital systems. For the past decades, advancements have allowed these modern units to operate at salinity levels below the threshold of human taste and completely eliminate yesterday’s concerns of corrosion and stone erosion. All modern units also have self-cleaning circuitry that minimizes the need for maintenance. 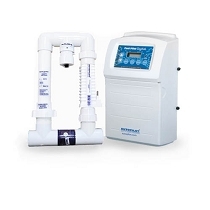 Beyond this, the single most important attribute of any system is the amount of power it has, or its chlorine output, always measured in terms of pounds per day (lbs/day) of sanitizer produced. More is always better. As for features, popular units all have warning lights that alert the pool owner of the need to add salt. Some display the actual salinity level of the pool water. Also popular is the Boost Mode or Super-Chlor feature which provides a one-touch method for temporarily increasing the sanitizer levels. Good digital systems modulate the power in a way that maximizes cell-life. Depending on the quality of the titanium cell plates, the various cells can now last between three and seven years with warranties to match. As with most electronics, the price of saltwater pool systems is not necessarily a good guide to quality or value. The comparison below provides all the details needed to make an informed decision in a consumer report style chart, so that you can get all the benefits of a salt pool at a great price, and ensure that you get the best saltwater chlorine generator for your pool's unique needs. How do I choose which size salt system for my pool? Correctly sizing a saltwater chlorine generator for your pool may be the most important consideration. There are two factors to look at when making sure that your system will be the right size. 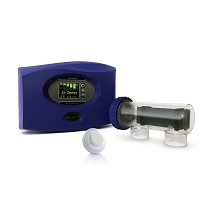 A right-sized chlorine generator ensures that you'll have the best experience possible, and that you'll no longer need to add any more chlorine, even to supplement, even after heavy pool use. 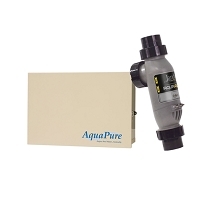 A saltwater chlorine generator needs to have a higher maximum capacity than what it might need on a daily basis. Salt systems are rated by manufacturers for sizing in two ways: 1) by the maximum number of gallons of water that can be treated, and 2) by the system's chlorine output (its sanitation power, or the amount chlorine it can generate in a 24-hour period). When considering a system's maximum gallon rating, you'll typically want to make sure to choose a system that can handle MORE than just the amount of water in your pool. So that your system won't be maxed on a normal basis, choose a system 1.5x to 2x the size of your pool or more. In other words, if you have a 20k gallon pool, you would at least want a system rated for 30k gallons, if not a 40k gallon system. Manufacturers don't typically do a good job explaining that the gallon rating is not a sizing guarantee, it is an absolute limit under ideal circumstances at the system's continuous peak performance- which is NOT how a pool owner wants to run their equipment. Considering a system's chlorine output will give you a more accurate idea of how powerful a salt system is. 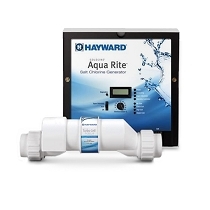 You'll notice that between manufacturers, two systems rated for a similar number of gallons might have a significantly different level of chlorine output. The higher the chlorine output, the more powerful the system, period. Its not the same for every pool, but many professionals estimate that at a minimum you want a chlorine output of .35 to .5 pounds per day for every 10,000 gallons of water in the pool. In short, remember that you can always turn your salt system's sanitation settings down if needed, but after a certain point you can't turn it up anymore. Having a system with more than enough power means that it will work just as well in scorching summer as it does in pleasant spring weather, and that you can handle problems that may arise after a storm or a pool party. Even better, the more powerful your salt system, the less hard it has to work everyday, so the slower it wears out. Most people who have been through it before will tell you that choosing a larger system gives you the best value and best experience all around. How do I choose which features and specs I want my salt system to have? There are some features that every saltwater chlorine generator absolutely has to have, and two specs that will give you the most system for your money. There are also a few features that many people choose to make a system more convenient and even easier to use. 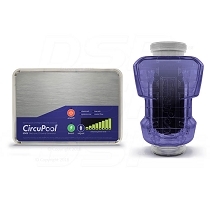 All new chlorine generators are Self-Cleaning, also called Reverse-Polarity. You absolutely want your system to be Self-Cleaning to minimize the amount of maintenance it needs; these systems reverse the direction of electric flow every so often to help reduce or prevent mineral scaling. Another necessary feature for a salt system to have is a Flow Sensor. This helps ensure that it works in coordination with your pump and adds to the safety of the system. Some models use a built-in electronic Flow Sensor; others use an independent Flow Sensor with a mechanical switch, which is preferrable for use with low-speed or variable speed pumps. New chlorine generators always have Digital Controls. Digital Controls are easy to operate; basic digital systems give feedback with an array of LED indicators, while high-end digital systems use LCD or backlit VFD or OLED display screens to communicate. There are two specs that play a direct role in increasing the value of a salt system, its Chlorine Output and its rated Lifespan / Warranty. A system with higher Chlorine Output has more sanitation power and will use up less of its resources to do the same job, meaning: its less likely that you would have to ever supplement with extra chlorine in a tough situation and the system itself will last longer. The greater the Lifespan and Warranty that a system has, the more return on your investment because the system will need less frequent replacement parts at a lower cost to you. There are a number of chlorine generator features that many people prefer. Systems that operate at a low salinity range ensure that the salt is virtually imperceptible in the water. Most pool pros would consider low salinity range to be under 4000 parts per million (ppm). 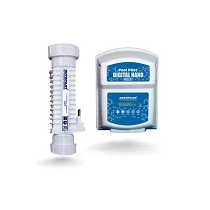 Pool owners also prefer a higher-end salt system that has a PPM Salinity Reading, which will detect and digitally display the salinity reading of the water. 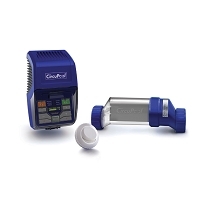 Many people prefer that the chlorine generator's has a Clear Cell (its plumbing component). Having a clear Cell lets you see the unit in operation and easily check to see if it might be clogged with debris or need service. Another convenient feature is a Boost Mode, or super-chlorination mode. 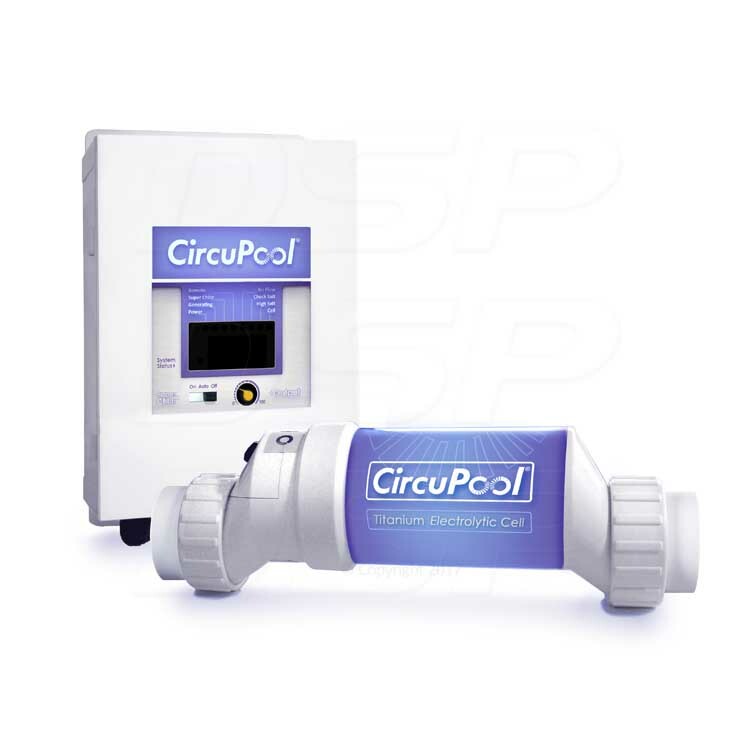 This is usually a one-touch feature that raises the chlorine output to max power for a time in order to deal with temporary pool problems. Which salt pool system is compatible with my pool & equipment? How do you know if your pool is compatible if you install a saltwater chlorine generator? There are only a handful of cases where there would be incompatible water chemistry, equipment, or materials. The vast majority of people's pools are compatible as they are- however, below are some examples of things to double check for if you are concerned. There are very few water chemistry conditions that would prevent you from converting your pool to saltwater. If you are using traditional chlorine in any typical form, you don't have to worry: your water is completely compatible, and you do not need to drain the pool or make any major changes. The salt pool system can be installed and will easily take over water sanitization. The most common chemical issue pool owners face is if they have been using the chlorine alternatives called biguanides, often under the name "Baquacil" or "Soft Swim". Most pool owners simply wait for such chemicals to dissapate to a low enough level in the pool over the winter before converting to a saltwater chlorine generator. 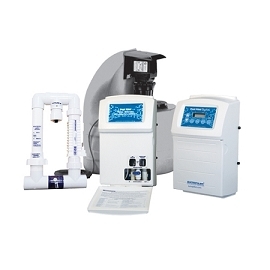 Saltwater chlorine generators are designed to work with your existing pump and filtration system, and are installed in addition to what you currently use. 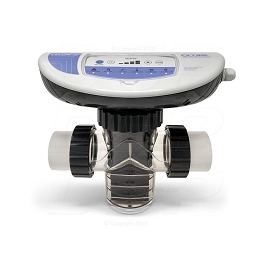 Many pool equipment manufacturers will even advertise that their pumps and fitlers are compatible with saltwater up to a high level of salinity. The most common equipment issue pool owners face is on very, very old pools that use iron or copper plumbing pipes, which are almost non-existent nowadays. Salt systems can be used on pools that are made of concrete, gunite, plaster, tile, vinyl, fiberglass, stone and more, and are common on in-ground and above-ground pools. Saltwater chlorine generators have been safely used on pools across the country for decades, and now its more common to have a saltwater pool than to not. If you have used rare or exotic materials in your pool construction, always check with your pool builder to ensure that there are no special requirements for your unique pool design. Which salt pool system is the best? One of the most common questions we are asked by pool owners who are ready to convert their pool and are comparing their different options is, "Which saltwater chlorine generator is the best?" It's an understandable question. The real answer to that is base on a handful of factors. The most important thing to know about the salt pool systems we have is that we only carry the ones that have been around, that have a proven track record, and that we consistently get positive feedback about. Put simply, the best salt pool system is the one that gives you the most power, the longest lifespan, and the features you want for the price. We can help you determine your pool's unique needs based on its size, environment, use, & more, and give you a professional recommendation. Or, use our online comparisions, reviews, and do-it-yourself resources to learn and inform your decision.